Most parents with one or more school-age children say it is easy to find after-school activities and programs in their community, and this is reflected in the fact that most parents say their children participated in some form of extracurricular activity in the 12 months prior to the survey. Sports or athletic activities are the most popular, but at least half of parents say their children ages 6 to 17 have participated in religious instruction, taken music, dance or art lessons, or done volunteer work. Even more parents report that their school-age children watch TV, movies or videos (90%) or play games (79%) on any electronic device on a typical day, and about half of these parents say their children spend too much time on these activities. About eight-in-ten parents with children younger than 6 also say their children have screen time on a typical day, but fewer say their children spend too much time watching videos or playing games on electronic devices. The survey asked parents with school-aged children about a variety of activities that take place outside of regular school hours. Sports are by far the most popular extracurricular activity for kids in this age group. About seven-in-ten parents (73%) with at least one child ages 6 to 17 say that their children participated in sports or athletic activities in the 12 months prior to the survey. Religious-based activities are also quite common: 60% of parents say that their children were in a church youth group or received religious instruction. About half of parents (54%) say that their children took music, dance or art lessons over that period, and a similar share (53%) say their children did volunteer work. About one-in-three parents (36%) say that their children received regular tutoring or extra academic preparation in the 12 months before the survey. And about one-in-five (23%) parents say that their children participated in an organization such as the scouts. Among parents of teenagers, 36% say that their children had a part-time job during the 12 months leading up to the survey. A similar pattern is evident across education groups, with college graduates more likely than those with some college or with a high school diploma or less to say their children have participated in extracurricular activities. For example, about eight-in-ten (83%) parents with a bachelor’s degree say their children participated in sports or athletic activities in the year prior to the survey, and 66% say that their children took music, dance or art lessons. Among parents with a high school education or less, the shares are 63% and 42%, respectively. In addition to sports and arts, children from families with higher income and education are more likely to do volunteer work than other children. Some 64% of parents with annual family incomes of $75,000 or higher say their children did volunteer work in the year prior to the survey, and the share among middle-income parents and low-income parents (less than $30,000) is 49% and 37%, respectively. Meanwhile, 62% of parents with a college degree say that their children did volunteer work over that period, compared with 54% of parents with some college education and 41% of parents with a high school education or less. Overall, relatively small shares of parents across socioeconomic groups say their school-age children participate in an organization like the scouts, but here, too, participation is more common among families with higher income and education. For example, 28% of parents with college degrees say their child or at least one of their children was a scout in the year leading up to the survey, compared with 20% of parents without a bachelor’s degree. Teenagers from higher-income families are more likely than their peers to have had some work experience in the year before the survey. Among parents with annual incomes of $75,000 or higher, 45% say their teenager worked at a part-time job during this period. About a third (34%) of middle-income parents and 25% of lower-income parents say the same. Race and ethnicity are linked to participation in some extracurricular activities but not to others. When it comes to athletic activities, there are no significant differences by race: white (75%), black (68%) and Hispanic (69%) parents are about equally likely to say that their school-aged children participated in sports in the year prior to the survey. And roughly equivalent shares of white (55%), black (47%) and Hispanic (52%) parents say their children took music, dance or art lessons over that period. White and black parents are more likely than Hispanic parents to report that their children participated in religious instruction or church youth activities in the 12 months prior to the survey. And black and Hispanic parents are more likely than white parents to say that their children have received tutoring or extra academic help over that period. 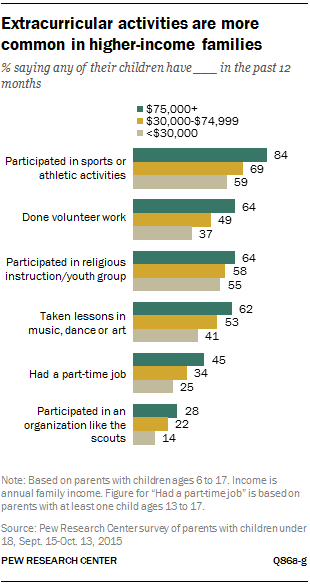 White parents are more likely than other parents to report that their children did volunteer work, had a part-time job or participated in an organization like the scouts in the 12 months leading up to the survey. For the most part, parents with younger school-age kids are as likely as those with teenagers to say their children participate in extracurricular activities. The exception is volunteering: Two-thirds (67%) of parents with only teenagers at home say that their children did volunteer work over the year prior to the survey, compared with 36% of those whose oldest child is between ages 6 and 12. Parents often play an active role in children’s activities. About three-in-ten parents of school-age children (31%) say that in the 12 months leading up to the survey, they helped coach a sport or athletic activity in which their children participate. Parents from different incomes and education, as well as racial and ethnic backgrounds, are equally likely to say they have done that over the same period. More fathers (37%) than mothers (27%) say they helped with coaching their children’s sports in the year prior to the survey, and parents with younger school-age children are more likely than those with teenagers to say this is the case. 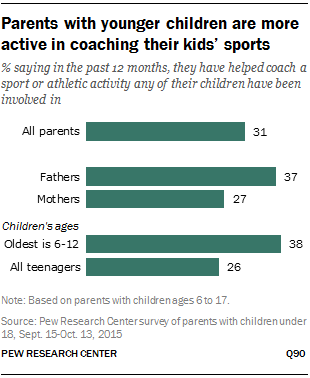 Among parents whose children are all under age 13, about four-in-ten (38%) had helped with coaching, compared with 26% of parents with only teenagers at home. While most parents say their children participate in extracurricular activities, relatively few say that their children’s schedules are too hectic. According to most parents (72%) with children between the ages of 6 and 17, things are just about right when it comes to their children’s day-to-day schedule. An additional 11% say their children have too much free time on their hands. Some 15% say their children’s daily schedule is too hectic with too many things to do. There are significant differences by race and income in parents’ perceptions about how busy their children’s schedules are. 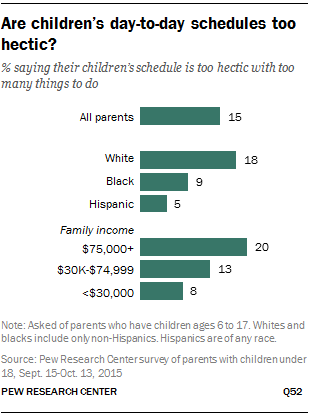 White parents (18%) are twice as likely as black parents (9%) to say that the schedules are too hectic. Among Hispanic parents, 5% say their kids’ daily schedules are too busy. Parents with higher incomes are more likely than those with lower incomes to say their children’s daily schedule is too hectic. One-in-five parents with an annual family income of $75,000 or more think their children have too many things to do during the day, compared with 13% of parents with an annual income of $30,000 to $74,999, and 8% of parents with incomes less than $30,000. Parents who report that their children are involved in a greater variety of activities are more likely than other parents to say that their children’s schedule is too hectic. For example, 8% of parents whose kids are in one activity or no activities say their kids’ schedules are too hectic, compared with 15% of those whose kids participate in two activities and 22 of those who say they participate in three or four.26 Still majorities of parents – regardless of the number of activities in which their children participate – say things are about right when it comes to their kids’ schedules. The most common after-school activities for today’s children may be sedentary. 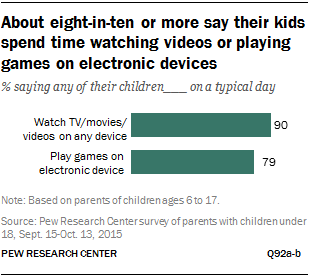 Nine-in-ten parents report that their children ages 6 to 17 watch TV, movies or videos (on any device) on a typical day, and about eight-in-ten say their school-age children play video games. Majorities of about three-quarters or more across racial, education and income groups say their children engage in these activities on a typical day. Overall, parents of school-age children are split about whether their children have too much screen time or about the right amount, based on the parent’s assessment: some 47% of parents whose child or children watch videos or play games on a typical day think their children spend too much time on TV, videos and games, while 50% think their children spend about the right amount of time on these activities. Compared with white (55%) or black parents (47%), Hispanic parents (23%) whose children have daily screen time are less likely to say that their children spend too much time in front of a screen. Instead, a majority of these parents (73%) say their children’s screen time is the right amount. Parents with higher education tend to worry a little more about their children’s screen time. 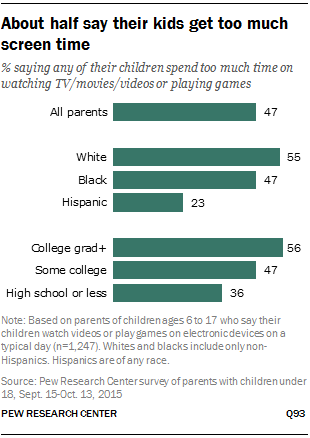 More than half of parents with a bachelor’s degree (56%) say that their children spend too much time on TV and video games, compared with 47% of parents with some college education, and 36% of parents with high school education or less. Parents with higher incomes are also more likely to be concerned about their children’s screen time. Some 56% of parents with an annual income of $75,000 or higher say that their children spend too much time watching TV or playing video games. By comparison, 46% of parents with incomes of $30,000 to $74,999 and 33% of those in lower-income families say their children spend too much time on these activities. Children’s ages may also play a role in their screen time. Among parents with only teenagers at home, 52% say that their children spend too much time watching TV or videos or playing video games, compared with 43% of parents whose children are all under 13 years old. A recent study on children’s media use finds that teenagers spend an average of nine hours per day on media use (through TV, Internet, smartphones, and so on) for purposes other than school or homework, and that children ages 8 to 12 spend about six hours per day in these activities.27 The study also suggests that low-income children are less likely than others to have access to computers, tablets and smartphones. However, when they do have access, they are more likely to spend more time on these devices. Organized activities such as sports or lessons in music or arts are less common among younger children. 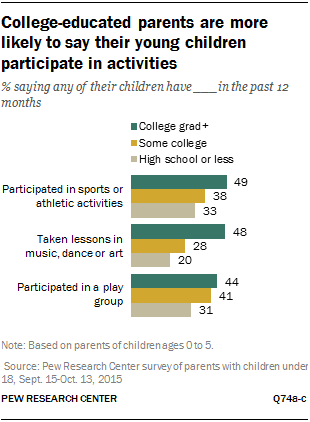 Four-in-ten parents of children ages 5 or younger say their kids participated in sports or athletic activities in the 12 months prior to the survey, and one-in-three parents say their children took music, dance or art lessons over that period. About four-in-ten (39%) say their young children participated in an organized play group in the 12 months. Parents’ education has a lot to do with their young children’s activities. College-educated parents are more likely than parents with lower educational levels to report that their children participate in all three activities asked in the survey. Nearly half of college-educated parents (49%) say that their kids younger than 6 participated in sports or athletic activities in the 12 months leading up to the survey; a similar share (48%) says their kids took music, dance or art lessons, and 44% say their kids were in a play group. By contrast, the shares among parents with high school education or less are 33%, 20% and 31%, respectively. Family income also plays a role in young children’s activities. About half of parents with family incomes of $75,000 or more (51%) say their child or children participated in sports, compared with 33% of parents with family incomes of $30,000 or less. Parents with higher incomes (46%) are also more likely than low-income parents (21%) to say that their kids took music, dance or art lessons in the 12 months prior to the survey. However, parents’ income does not seem to affect whether their children participate in an organized play group. Also, parents with different racial and ethnic backgrounds are equally likely to say that their kids have participated in these three activities. Preschoolers are also frequently in front of a screen. On a typical day, a majority of parents (81%) say that their child or children ages 5 or younger watch TV or movies or play games on any type of electronic device (such as a computer, tablet or cell phone). Meanwhile, about a third of parents whose children have daily screen time (32%) worry that their children spend too much time on these devices, although more parents think their children’s screen time is about right (65%).